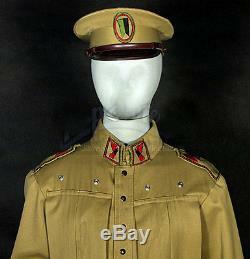 DUNE HOUSE ATREIDES DESERT OFFICER UNIFORM AND VISOR CAP. 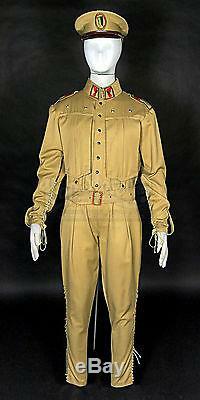 Custom made-for-production House Atreides Arrakis desert officer jumpsuit and visor cap. Jumpsuit is made from medium weight tan cotton with numerous pockets and ventilation flaps. Jumpsuit retains its original costume house tag on the interior. Size is unmarked however it appears to be approximately a Mens Large. The visor cap has a dark brown visor and chin strap, with the body made from tan cotton. Size is marked as 59. 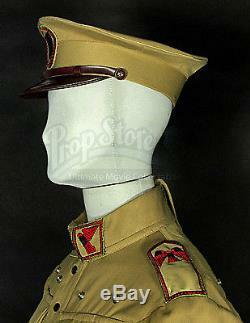 The costume is in very fine condition showing wear from use while filming in the harsh Mexican desert. The original Certificate of Authenticity (COA) from Prop Store is included. TERMS and CONDITIONS of SALE: The photo(s) show the actual item for sale which has been described to the best of my ability. You have reviewed the description and photos provided, b. 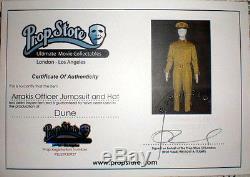 The item "Dune House Atreides Desert Officer Uniform & Cap Original Movie Costume Prop" is in sale since Friday, December 25, 2015. This item is in the category "Entertainment Memorabilia\Movie Memorabilia\Wardrobe\Originals". The seller is "docholl" and is located in Vallejo, California.